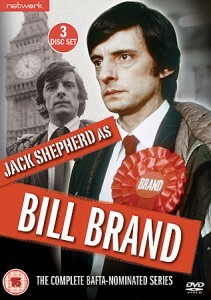 The fact that the 1976 political drama series “Bill Brand” was actually made by ITV is incredible by today’s television standards. The 13 Part series, now available on DVD, tells the story of a Richard Boyd Barrett style socialist elected a Labour MP during a minority Labour govt in the 1970s, and the internal politics of the party. Like a lot of TV drama from the era, it can be very talky (especially the scenes about Brand’s relationships with his disgruntled wife and his ultra-feminist “wanting a man in your life is a weakness and betrayal of the sisters” girlfriend.) but some of the scenes about the challenges of creating a genuine socialist society are actually fascinating, especially as Brand puts positions which today would be regarded as archaic. One episode, for example, is about him trying to have tariffs put on yarn, and this was mainstream TV drama on the channel that now carries The X Factor! In another, Brand decries an unemployment rate of 7%! Watching with the benefit of hindsight, it almost makes one laugh to think that the left thought that the Wilson/Callaghan governments were the absolute worst that could happen to them. The other feature striking in the series is that union membership was very widespread in the private sector, and union leaders regarded private sector workers as important to the unions as public sector workers, which certainly is not the case today. The cast, led by Jack Shepherd, are excellent, and is populated by at least three actors who would become famous later for their roles in well known sitcoms or in one case as a future Bond villain. I won’t spoil it, but one actor plays a socialist junior minister exactly how he later plays a very different role for which he becomes famous for. The prime minister is also played by an actor who became famous for a much loved comedy role too, a role he was actually playing on a different channel at the time this was made. One thing which strikes me about the show is how the left has changed. In it, Brand makes a big deal throughout the series about how workers are being exploited despite the huge amounts of work they do. He argues not that they are entitled to better pensions and healthcare, etc, but that they earned them through a life of work. It is an interesting juxtaposition with today’s left which does not put anywhere near as much emphasis on the need to contribute to society, instead telling people that they are entitled even if they have not contributed. The show was quite foresighted, though, in other ways. One senior figure lays out a vision of Labour, in the mid 1970s, no less, that is very similar to Blairite New Labour, 20 years ahead of time. One other aspect of the series which is interesting from an Irish perspective is the internal ideological debate within the party, to a degree undreamed of in an Irish political party. I have really enjoyed this series (although seen far too much of actor Jack Shepherd walking around in his extra tight Y fronts) because it expects the viewer to engage with the discussions about politics and socialism. As I said, it is very talky, but well worth watching to anyone who takes their politics seriously. And it has a theme tune which you will find yourself humming after a while.